LOWELL, Mass. 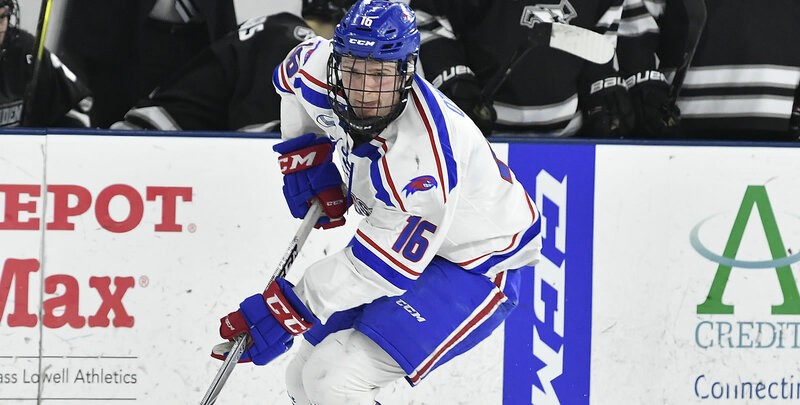 - The UMass Lowell Hockey team edged Vermont, 6-5 in Hockey East play on Friday night at the Tsongas Center in front of 4,163 fans. UMass Lowell improved to 12-8-1 overall (6-4-1 HEA) with the victory, while Vermont drops to 8-12-1 overall (1-9-1 HEA). UVM's Johnny DeRoche scored to make it a 5-5 game midway through the third frame. Senior forward Ryan Dmowski (East Lyme, Conn.) scored the game-winning goal for the River Hawks with 6:50 to play in the third for his sixth goal of the year. The two teams traded punches in the third with a goal by UMass Lowell's Colin O'Neill to open the period at 4:08 to give the River Hawks a 5-3 lead, but Vermont responded less than two minutes later with a tally by Derek Lodermeier. Vermont's Conor O'Neil added a goal for the Catamounts with 2:17 left in the second period to cut the River Hawks lead to 4-3. Junior forwards Ryan Lohin (Chadds Ford, Pa.) and Kenny Hausinger (Anchorage, Alaska) added goals for the River Hawks less than two minutes apart to give the River Hawks a 4-2 lead in the second stanza. Lohin scored on a wrister from the low slot for his team-leading ninth goal of the year. Liam Coughlin gave the Catamounts a 2-1 lead with 6:09 to play in the opening period on the power play. Connor Wilson (Calgary, Alta.) evened the game at 2-2 for UMass Lowell with an extra man goal of his own less than two minutes later for his sixth goal of the season. He scored off a deflection after a Mattias Goransson (Slottsbron, Sweden) slapshot from the high slot. The teams combined to score four goals in the opening frame with the River Hawks getting on the board first on a goal by Sam Knoblauch at 8:44 of first frame for his fifth career tally. Vermont tied the game up just 20 second later on a goal by Vlad Dzhioshvili to tie the game at 1-1. Senior goaltender Christoffer Hernberg (Espoo, Finland) made his fourth straight start for the River Hawks posting 28 saves in his seventh win of the season, which included 14 stops in the third period alone. Vermont's Stefanos Lekkas totaled 15 stops for the Catamounts in the losing effort. Senior forward Nick Master (Broomall, Pa.) had a career night in the face-off circle winning 19-of-25 (76%) in the River Hawks' victory. The River Hawks conclude the two-game series with the Catamounts on Saturday, January 19 on the second night of Stars Wars Weekend with the 501st Rebel Legion in attendance at the game. Game time from the Tsongas Center is 7 p.m.